long-time friends celebrated Elizabeth's birthday by spending a weekend with me, each creating her own unique panel. 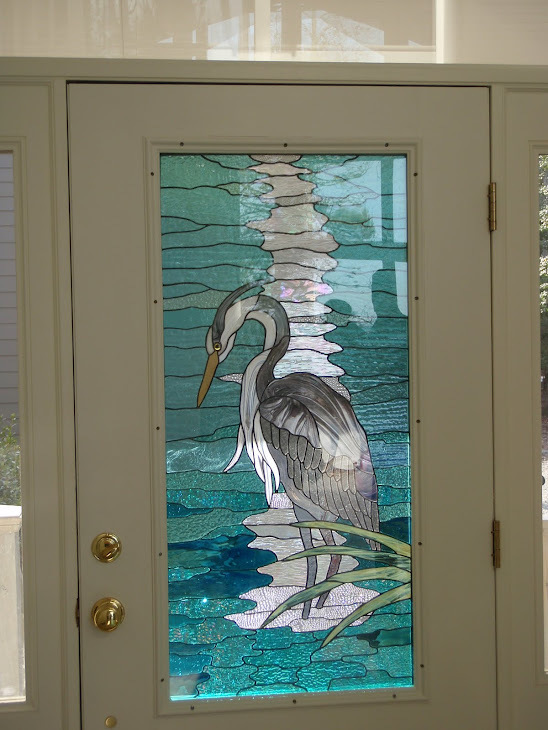 Sarah, Casey and Amy were doing stained glass for the first time; Elizabeth is an experienced glass artist, and that's just one medium in her repertoire. thank you all for being so much fun, and for offering your quotable quotes to the magazine writer who came for an interview just at our most crucial part of the process. you were all very gracious and I thank you. when Tom's article publishes, I will send copies to all of you. it's still too hot for me, but not as hot as during your stay. 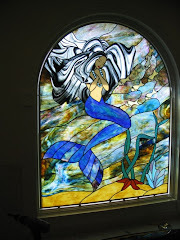 I am finishing up the mermaid in air conditioned comfort. I'll visit the ivory tower when temps come down below 80 degrees! recently, alison visited me again for a "mom's getaway". baby Jeremy has kept her busy this past year and she was ready to relax. so how relaxing was this? well, we all have our own idea of relaxation. and we did have a great time, designing and creating this art nouveau panel. thanks alison for choosing Zekiah Glass for your getaway. and before any viewers get carried away, keep in mind that we spent 3 days, not 2, on this, and Alison is definitely NOT a novice; she has done several beautiful panels in the past. the pinks and greens were a perfect color theme for this flowing flower-like design.